IT’S FINALLY SPRING! We don’t care how chilly it is outside because FINALLY it is above 50 degrees, things are blooming, and there is SUNSHINE! Oh. My. Goodness. 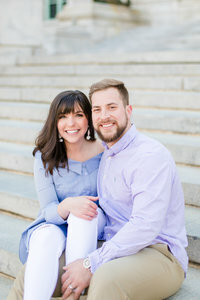 The sun made for the most BEAUTIFUL glow last evening for Lisa’s Jefferson Patterson Park family session to celebrate her little baby girl’s 1st birthday! Kyle and Lisa’s stunning little girl turns one in a few days, and her momma wanted to make sure that this moment was documented for a very good reason. This little angel had been born 9-weeks premature and spent 6 and a half weeks in the hospital before she was able to finally come home. She was perfect then and BOY is she perfect now. Just look at those baby blues!! Happy birthday, sweet girl. We can’t wait to watch you grow! To view more Jefferson Patterson Park family sessions, browse the links below!